Tonsillectomy is commonly performed in children for really 2 main conditions... chronic tonsillitis (whether from strep of other) or obstructive sleep apnea. This surgery is overall considered safe and effective. However, experienced clinicians have also known that complications occur more frequently in children under 3 years of age. As such, for a very young child, this surgery is often recommended to be delayed if at all possible until a child is over 3 years old. But is this concern actually true? Based on a large study published in March 2018, this increased risk of complications is definitely true for those under 3 years old, independent of weight. 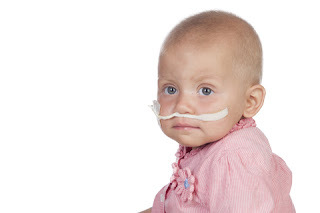 Based on a study group of 1817 children, ages 12-72 months, there was a 5.2% complication rate. When the study group was divided into those under and over 3 years old, there was a 7.0% complication rate for those under 3 years compared with 4.6% for those over 3 years old. Overall, there was a 1.5 times greater risk of complications if the child was under 3 years old. Complications documented included hemorrhage, dehydration, and airway distress. With respect to airway distress, those under 3 years of age experienced this complication 6 times more frequently than those over 3 years. At least in my practice, given I perform tonsillectomy and other surgeries only in a small community hospital without a pediatric ICU unit, I typically recommend any patients under 3 years old who truly needs to undergo tonsillectomy to see a different ENT who can perform in a hospital with a PICU in case any complications occur. As an aside, narcotics are no longer given to children under 7 years of age let alone 3 years. Studies have found that tylenol and motrin provide equal pain control to narcotics without the respiratory depression risk. Read why. Surgical management of obstructive sleep apnea in infants and young toddlers. Otolaryngol Head Neck Surg. 2009 Jun;140(6):912-6. doi: 10.1016/j.otohns.2009.01.034. Epub 2009 Mar 9. Outcomes in children under 12 months of age undergoing adenotonsillectomy for sleep-disordered breathing. Laryngoscope. 2013 Sep;123(9):2281-4. doi: 10.1002/lary.23796. Epub 2013 Jul 2. Is outpatient tonsillectomy appropriate for young children? Laryngoscope. 1992 Mar;102(3):277-80.